You’ve no doubt heard the news that Glamour is set to cease its monthly print edition and is going all-digital in 2019 (except for special issues). The American glossy has been on the market for almost 80 years and is currently headed up by Samantha Barry, who kick-started her tenure earlier this year with a rather disastrous Melissa McCarthy cover, followed by a string of disappointments featuring the likes of Anne Hathaway, Kate McKinnon and Tiffany Haddish. 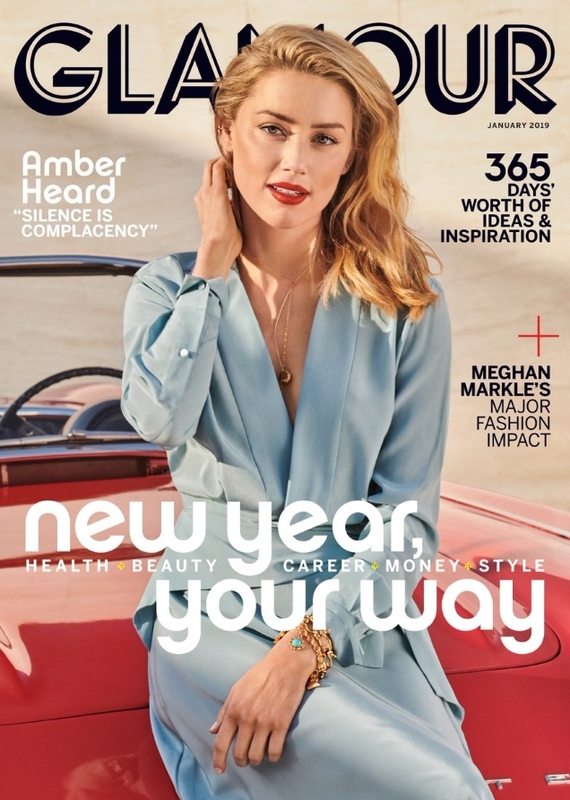 Thankfully, Glamour ends its print tenure on a high note with a stunning retro cover featuring Amber Heard for January 2019. The American actress was photographed sitting on a vintage car by Jason Kibbler, wearing a baby blue Equipment dress styled by Vanessa Chow. For the most part, our forum members thought the cover was a triumph. “Now they want to up the ante? What an effortless yet beautiful cover image! And for once, the art direction really looks interesting. But then Amber has always been gorgeous, even during her pre-Depp lipstick lesbian days. I’m also really keen to read her feature because that coverline sounds so cryptic and intriguing,” noted Benn98. “What a total shame this marks Glamour‘s last monthly print issue, especially considering this is easily the best cover Samantha Barry has done. I love the retro styling, the colors and think overall the cover is very refreshing for January,” vogue28 credited. “I love this cover,” chimed in samoanceleb. “I originally wasn’t too fond of it, but I’ve grown into liking it. I guess its a fitting last print issue,” SLFC confessed. Yet the cover wasn’t to everyone’s taste. “Zero creativity, tacky and cheap glamour. The logotype of this magazine is diabolical,” called out Perickles. Are you optimistic about Glamour‘s venture to digital? Think this cover is fitting to wave goodbye to print? Sound off and share your thoughts here.